This is setup options for Mantis send method (wsmMantis). They are located at Sending tab. Warning: be sure to setup adequate maximum upload file limits in your web-server/Mantis configuration. Otherwise sending may fail on large bug reports. 2. "Port" (.SendMantisPort) option specifies HTTP port on web server. It's 80 by default. Other common value is 8080. For SSL/TLS it's usually 443. Port will be set automatically to 80/443 by default. 3. "SSL / TLS" (.SendMantisSSL) option enabled secure mode (HTTPS protocol). Port will be set automatically to 80/443 by default. Don't forget to adjust port number, if you are using an alternative port number. 4. "Login" (.SendMantisLogin) and "Password" (.SendMantisPassword) options specify your account on Mantis server. This account will be used to submit bug reports. Do not specify e-mail or full user name as login, use only user name. You can use API token instead of password - however, you still have to supply a valid login (user name). Warning: your real account's data will be stored inside application. Even if it's encrypted - it's still stored inside .exe, so it can be stolen. DO NOT use Mantis admin account here. Create a new special account for bug reporting via this method. Limit its rights to submitting only. Note: it is a good idea to disable e-mail notifications for this account. It is a good idea to make this account "protected". 5. "BasicAuth" (.SendMantisBasicAuthLogin, .SendMantisBasicAuthPassword) options specify account details for Basic-Auth type authentication. Usually these fields are blank. Fill them, if you use Basic-Auth on your web server. 6. "Proxy" (.SendMantisProxyHost, .SendMantisProxyPort, .SendMantisProxyLogin, .SendMantisProxyPassword) options specify proxy details. You can leave them blank to use system-provided settings. Or you can fill these values to set custom proxy. 7. "Connect" button will try to connect to your Mantis server using the specified URL/port/credentials. If you made a mistake in your configuration - an error message will be displayed. In case of success - field below will be populated from configuration of your bug tracker. 8. "Project" (.SendMantisProject) options specifies project name to store bug reports. It's mandatory. 9. "Assign to" (.SendMantisOwner) option specifies owner account name. If this option is empty, all submitted bug reports will be unassigned (and their state will be "new"). If you enter here any account name (it could be the same as "Login" option) - all submitted bug reports will be assigned to this account (and their state will be "assigned"). Note: this option is ignored, if submitted bug report already exists (submitting a known issue). 10. "Category" (.SendMantisCategory) option specifies category for submitted reports. It can be optional or mandatory - it depends on your Mantis version and project configuration. 11. ""Count" field name" (.SendMantisCountFieldName) option specifies name of custom field, which EurekaLog will use for bug report counting. By default, Mantis doesn't have any "occurrences" or "count" fields, so you can't know how many times bug has occurred. To workaround this problem, you can create a custom field in Mantis configuration, which you will use for this purpose. You can enter name of this field here - and EurekaLog will use it to count bugs. 12. ""E-mail" field name" (.SendMantisEMailFieldName) option specifies name of custom field, which EurekaLog will use to store e-mail of user who sent (original) report. By default, Mantis doesn't have such field. 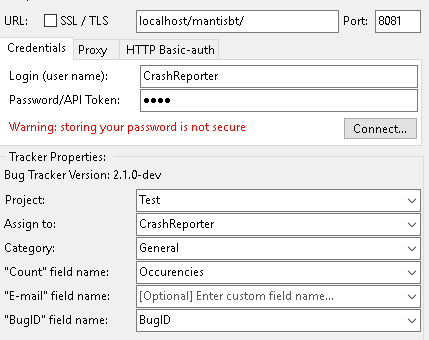 You can either create a custom field in Mantis configuration, which you will use for this purpose; or you can simply extract e-mail from bug report (file attach). 13. ""BugID" field name" (.SendMantisBugIDFieldName) option specifies name of custom field, which EurekaLog will use to store BugID. By default, Mantis doesn't have such field. You can create a custom field in Mantis configuration, which you will use for this purpose. When field is specified - it will be used by EurekaLog to search/merge reports. Otherwise title (summary) is used for merging. 14. "In progress statuses" (.SendMantisInProgressStatuses) option specifies which statuses indicate that issue is IN PROGRESS. The list can contain one of more values. Separate individual values with semicolon (";"). This option is case insensitive. 15. "Closed statuses" (.SendMantisClosedStatuses) option specifies which statuses indicate that issue is CLOSED. The list can contain one of more values. Separate individual values with semicolon (";"). This option is case insensitive. 16. "Use/fill "Product version" field" (.SendMantisUseVersion) option instructs EurekaLog to use "Product Version" field in Mantis. Disable this option, if you've customized this field and/or use it for other purposes. You can also fill this field manually instead of automatic generation by EurekaLog. • You must enter valid versions into Mantis configuration. You also need to store version information in your executables to fill this field. 17. "Require "Released" status" (.SendMantisRequireReleased) option will perform version search only on released versions. Otherwise non-released versions will also be used in search. 18. "Search match up to N numbers" (.SendMantisMinVersion) option specifies how version search is performed. 19. "Upload bug report files for duplicates until bug is closed" (.SendMantisUploadFilesForDups) option allows you to collect all bug reports. If this option is unchecked (default): only first bug report is uploaded and stored. All other bug reports for the same problem (identified by BugID) will be discarded. Only "count" field will be increased (if it was configured). If this option is checked: bug reports for the same problem will be uploaded to issue. • you can also stop collecting files by changing status to "confirmed" or "acknowledged". 20. 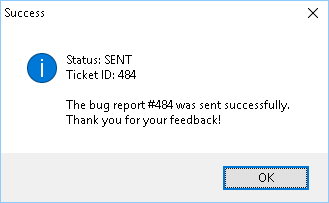 "Append bug report text to additional information" (.SendMantisAppendText) option allows you to insert bug report's text into "Additional information" field. It's convenient, if you need to peek bug report without downloading bug report file. You can turn this option off, if you don't need this behaviour. 21. "Append only call stack instead of full report" (.SendMantisUseCallStackAsBugReport) option alters previous option. Disabled: full bug report text will be added (e.g. general section, call stack, modules, processes, CPU/assembler, etc. ); Enabled: only call stack will be added (you will still be able to view full bug report by downloading file attach). 22. 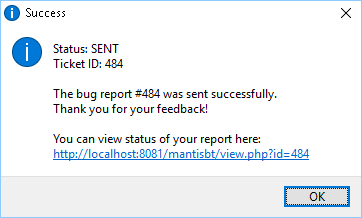 "Append bug opening link to "Success" message" (.SendMantisAllowLinks) option will add a link to view bug report on Mantis to message dialog after successful send. 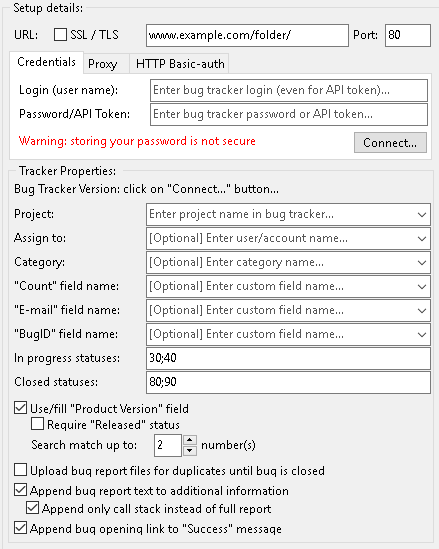 So end user (client) will be able to view status of the report on your bug tracker (login is required).